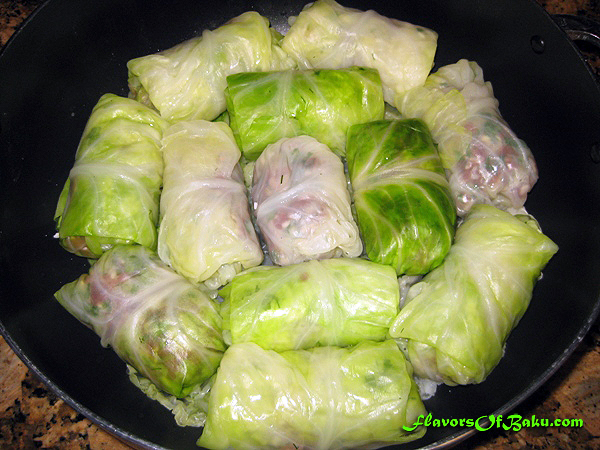 YARPAGI (stuffed cabbage leaves in sour sauce) – the Mountain Jews dish. The story of the Azerbaijani Mountain Jews began thousands years ago during their exodus from Israel. They passed through Persia, where they picked up an ancient, Farsi-based language and seasoned it with Aramaic, Arabic, and Hebrew, and most of them settled in Baku, Shemakha and Kuba – three Azerbaijani cities. The Azerbaijani Mountain Jews also refer to themselves as Tats (pronounced like taught). “Tat” is a word of Turkish origin. The Mountain Jew settlements are not isolated, they live among the Azerbaijani people and often referred to as “Azerbaijani Jews.” According to statements by Azerbaijani ethnographers, the national culture and cuisine of Mountain Jews is almost identical to that of the Azerbaijani people. Mountain Jews are well known for their delicious cuisine. The unique recipes of many dishes have been passed down from generation to generation. Many of dishes have been influenced by Azerbaijani cuisine and often share almost the exact same names as their Azerbaijani counterpart. 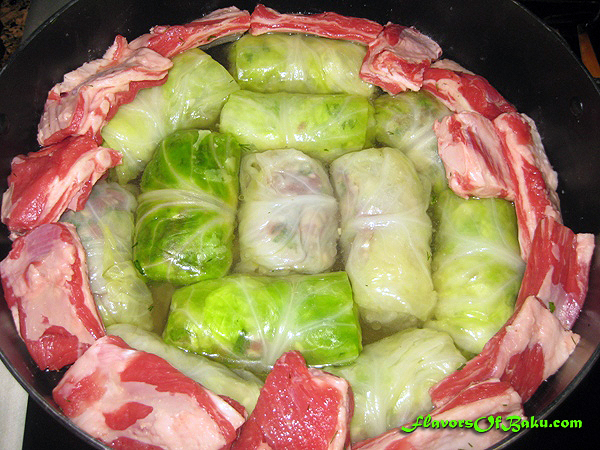 Byugleme (Buglama), Kyurze (Gyurza), Khashil, Osh (Ash/Pilaf), Dugovo (Dovga), Khayle (KyuKyu), Dolma, Chudu, and Ingar (Khingal) are only some examples of such dishes. 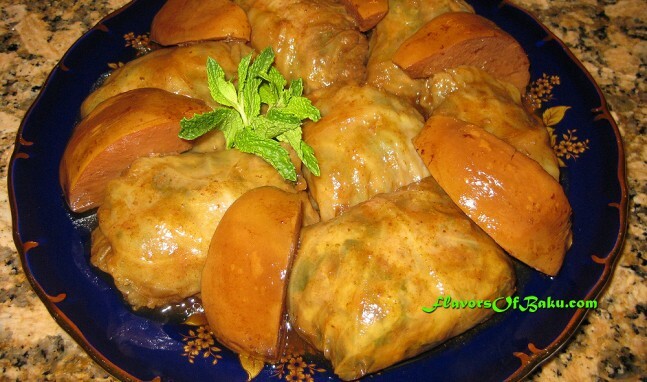 The Mountain Jews have their own strictly national dishes as well, such as Khoyagusht–a dish made of meat, eggs and chestnuts; and Yarpagi–cabbage leaves stuffed with chopped meat and cooked in a sour sauce. Yarpagi is usually served with rice (Osh), but sometimes on its own. 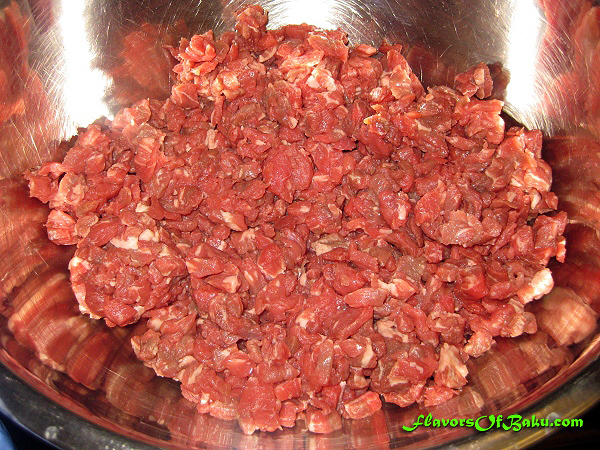 Cut the meat into very small size pieces. Chop washed and dried herbs. 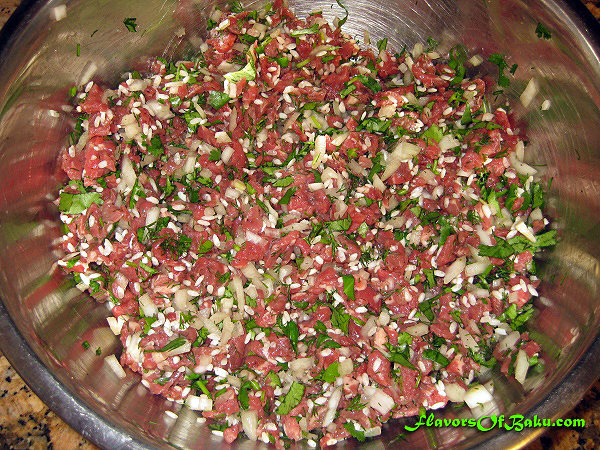 In a large bowl mix together the meat, onion, herbs, washed rice, and season with a salt and pepper. 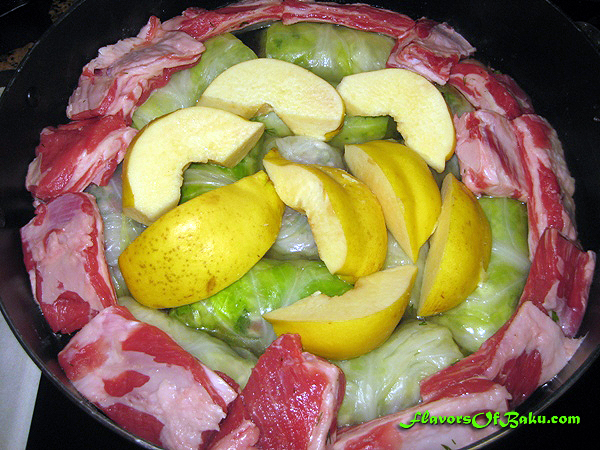 Leaves of cabbage need to be softened so that they are soft enough to be pulled off of the head and rolled up with stuffing. 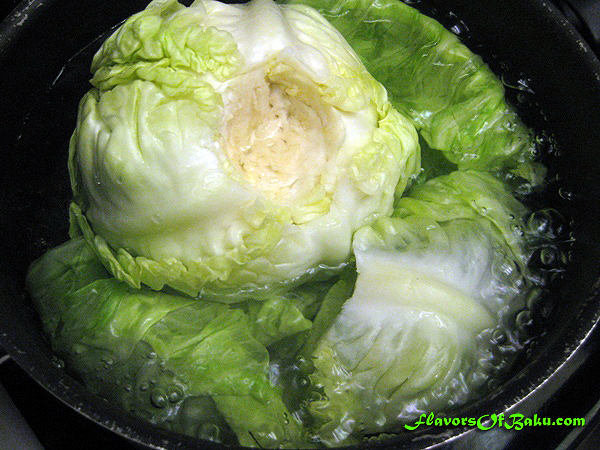 Remove the core from the head of cabbage with a knife, place the whole cabbage in a large pot of boiling water, and leave to simmer. 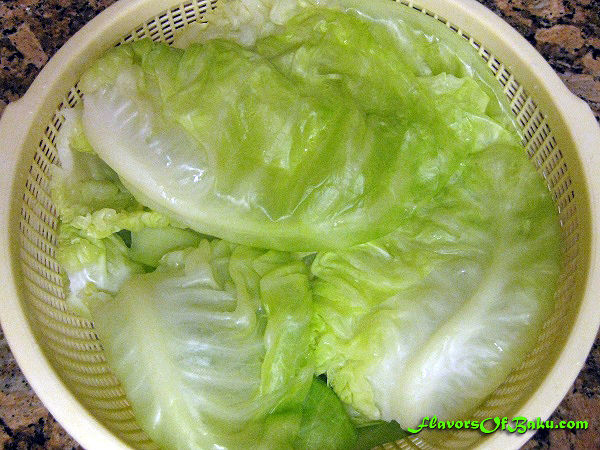 As cabbage’s leaves soften, use a fork to separate them from the rest of the cabbage. Place the softened leaves in a colander to drain. Repeat until all of the usable leaves are free. When the leaves are cool enough to handle, use a knife to remove as much as the tough stem from each leaf as you can without cutting through the leaf itself. 1. 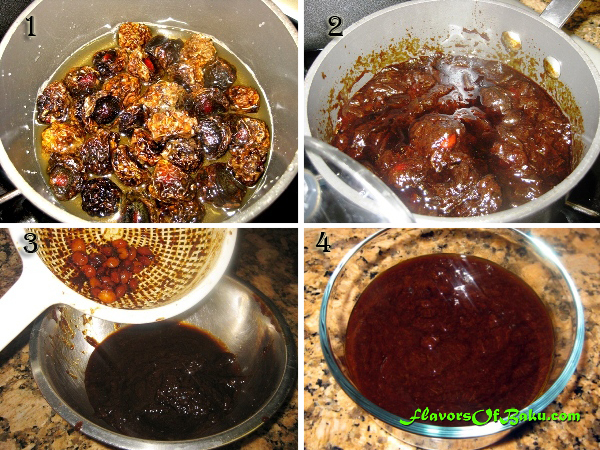 Place the dried sour plums in a small saucepan, cover with water and bring to a boil. 2. Lower the heat and simmer until the plums are soft enough to mush. 3. Then strain them through a colander into the bowl, pressing and rubbing softened plums to get the pulp out but keeping the pits and skins in the colander. 4. The sauce should have a consistency like ketchup. Store it in refrigerator when you’re done. 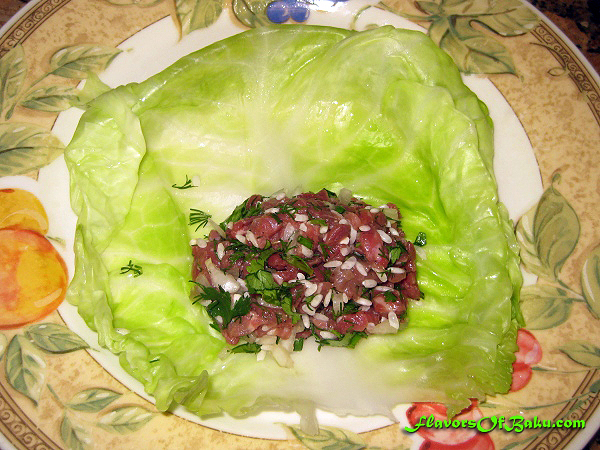 Place the meat filling (about 2 table spoons) on the leaf and fold the leaf into shape of square, making sure the sides and corners are fold tightly. Place some unused leaves at the bottom of the saucepan, and then place each folded Yarpagi as close as possible to each other. 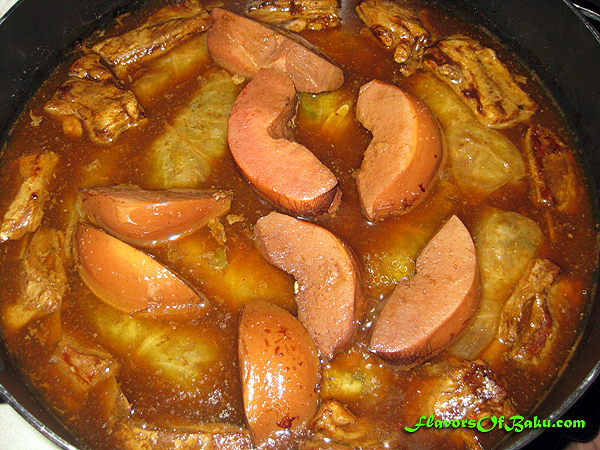 Somewhere, randomly, on top, place the cleaned and sliced pieces of quince. On top place a suitable inverted plate, to prevent Yarpagi from unfolding during the cooking process. Pour boiling water or a beef stock to the level of the plate, and over the medium heat bring it to the boil. 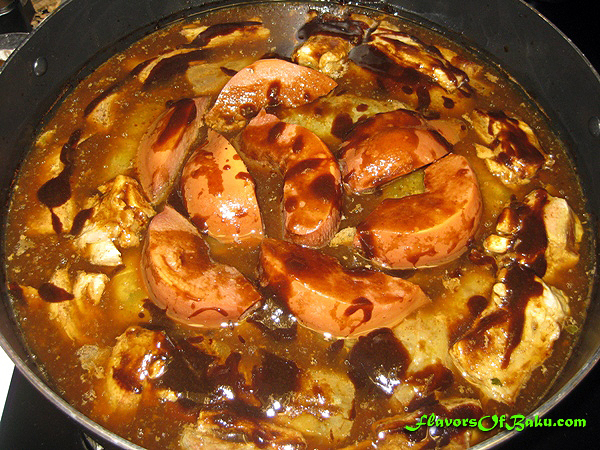 Turn the heat down, cover the saucepan with a lid, and simmer for about 4 hours over low heat. Remove the plate from the saucepan and pour the sauce all over the Yarpagi. Cover the lid and cook for another hour over a low heat. 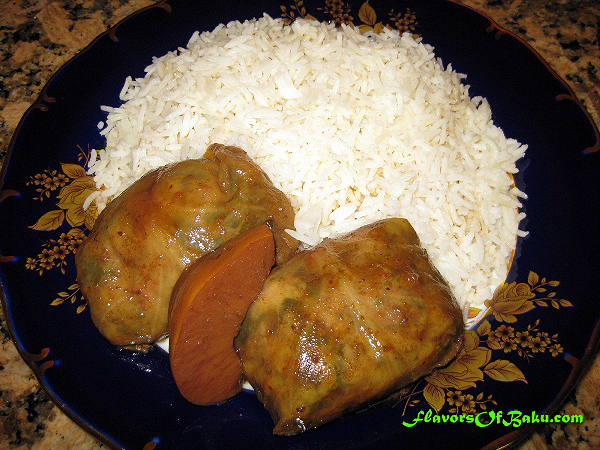 Serve Yarpagi with rice (Osh).